We are just back from a chilly and breezy but interesting morning at a wool festival. 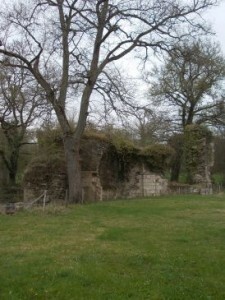 It was organised by Laines Locales of Limousin and was held at nearby Prébenoit Abbey. Had the weather been better we would have cycled there – it’s about 10 km away – but we’d have been blown backwards! The first person we met at the fair was Edouard, the farmer who cuts our hay and from whom we bought our sheep. We told him about recent ovine-related events chez nous and he was most sympathetic at our lost lamb. He said that his father lost fifty lambs this year due to the extreme cold. They were born at the wrong time. Sheep farming is obviously a tough business. Edouard’s young son Axel was helping his dad. 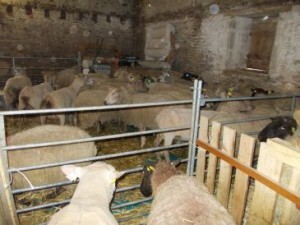 They had brought a large selection of their sheep for display. These included some two-day-old twin lambs. They were tiny compared to our lamb. We had suspected he was on the large size. His brother that we lost was even bigger. If our girls had only had twins, we might have been OK. 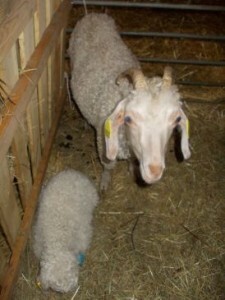 There were locally bred Angora and Gotland goats there too. Angoras have their famous hair, and Gotlands have four horns. Some sheep were being sheared. Chris watched this carefully. He’ll be tackling our girls soon. The lady shearer made it look incredibly easy. She completed each sheep in less than ten minutes. I’m sure Chris will be up to those speeds soon! 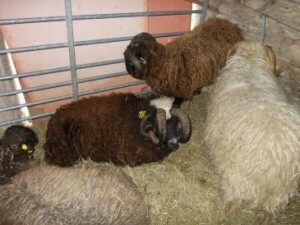 There were lots of stalls selling wool, felted goods, soap and other handmade goods. Ruadhri discovered the Dutch stroopwaffel stall. We were introduced to these by the lovely Fortanier family who stayed at our gîte while renovating their own house a few years ago. In fact, the last time I visited Prébenoit was to see Frédéric Fortanier’s art display. We bumped into one half of the English couple who keep alpacas near Toulx Ste Croix. Everyone has been telling us about them, since we’re the only other alpaca owners in Creuse. At last our paths have crossed. 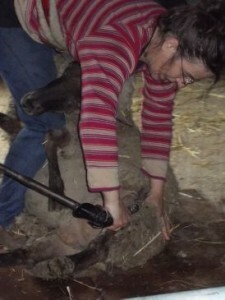 Linda was selling alpaca rovings (raw wool for processing) as a first foray into commercialising their herd. We’ll be keeping in touch and visiting each other’s élevages at some point. So it was a very sociable and enjoyable occasion, but we were glad to back to the fire at home. It’s unseasonably cold, which seems all the colder after the weather being unseasonably hot for so long!